Many people use the term TMJ to refer to any sort of jaw pain or TMJ disorder. However, the acronym TMJ simply stands for temporomandibular joint, the technical name for the jaw joint. With that in mind, we will refer to TMJ disorders as TMD, so there is no confusion between the health condition and the joint itself. We’re going to take a closer look at the symptoms before we offer hope by means of a natural therapy at the conclusion of the article. So what symptoms can present with TMD? Here are 8 ways that TMJ disorders can make a person’s life miserable. This is the most common symptom and perhaps the reason why the acronym for the jaw has become synonymous with its dysfunction. Pain is most likely to be felt when the jaw is in use such as while chewing or speaking. The pain may come and go or be constant. The TMJ is a unique joint because it operates in two ways. You can open and close your mouth with it acting as a hinge joint, but you can also slide the lower mandible from side to side with it acting as a sliding joint. When suffering from TMD, you may find that one or more of these motions is restricted, either because it causes too much pain for you to do it or because the jaw becomes locked in place. While sound coming from the jaw doesn’t automatically mean you are suffering from TMD, it can be a symptom. Sounds can range from a clicking or popping sound to a grinding or grating noise. The volume of the sound can also vary. Sometimes the pain begins to radiate away from the jaw. This makes sense since a misalignment or inflammation may be putting pressure on the trigeminal nerve, a nerve which branches into three directions. One branch goes above the eye, one below it and into the cheek, and one along the jawline. 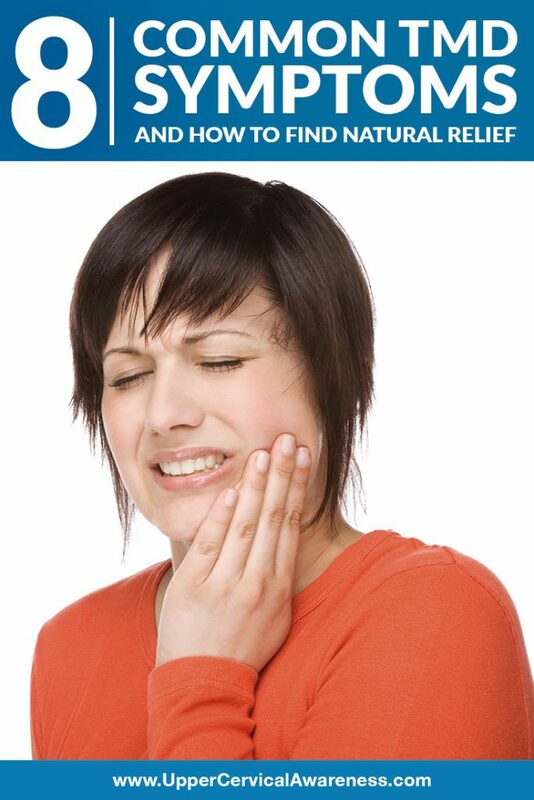 The pain is often one-sided and gets worse when the jaw is overexerted. The ear does not escape symptoms in most TMD cases. Tinnitus, in particular, refers to a ringing, buzzing, or rushing sound in the ear. There is no actual external stimulus. The sound is caused by an issue inside the ear, usually with the amount of fluid in the ear or the levels of cerumen (ear wax). Severe tinnitus can make it tough to hear, and it is rough on concertation as well. Many patients complain of a malocclusion. In other words, the teeth are not lining up properly in the top and bottom jaw. The jaw misalignment can be a symptom of TMD, or it can be the primary problem. If the teeth lined up well before the pain started, it is more likely just to be a symptom. Again, this inflammation can actually be causing some of the symptoms such as the radiating face pain. The good news is that inflammation generally responds well to ice, so be sure to use ice and not heat if you are suffering from inflammation. A non-steroidal anti-inflammatory drug such as ibuprofen may also provide some temporary relief. TMJ pain can also radiate both upward toward the ear and downward toward the neck. Some patients even experience headaches. This radiating pain makes sense when you consider the close proximity of the structures of the body. For example, the atlas (top bone in the neck) is located just about directly between the ears as well as the TMJ on either side of the face. It is reasonable then that a misalignment in this location could have many of the effects that we have just discussed. If you are still suffering from TMJ problems, the problem may lie deeper. If the atlas has become misaligned, it can certainly affect the jaw. The best way to determine if such a misalignment exists is to see an upper cervical chiropractor. If this is the first time you are hearing about this subspecialty of chiropractic, what do you need to know? It’s focused – Upper cervical chiropractors just focus on the top two bones in the neck. It’s precise – Using modern diagnostic imaging, misalignments are pinpointed down to fractions of a millimeter. It’s gentle – Low force corrections are long-lasting and safe for all members of the household. There are none of the twisting or jerking motions of general chiropractic. Chronic TMD can be difficult to deal with, but you may have just found a natural way to get help. Contact the upper cervical practice nearest you using the search feature on this site. A consultation can help you to determine if this is the right form of natural care for you.